One look at these bunches of vibrant crimson and deep green leaves and I was won over. Nothing could be that beautiful and not taste delicious. I bought myself a bagful, and it was only then that I realised I didn’t have a clue what to do with them. Of course, when in doubt, ask the person doing the selling, which in this case was a man with a white cowboy hat and matching goatee beard. While he looked perfectly qualified to point me in the direction of a decent rib eye and some bourbon, he didn’t have the air of a vegetable aficionado. When I asked him how he suggested I cook the chard, he looked me deep in the eyes, scrutinising my expression, suspicious that I was perhaps trying to be funny. I clearly didn’t look like much of a vegetable aficionado either, a shortcoming of which I am often reminded. Luckily, he decided to give me the benefit of the doubt, rather than to gun me down with the Smith & Wesson he no doubt kept hidden behind the cabbages, and proceeded to give me an impassioned lecture on the many beneficial properties of the vegetable. At a certain point, he turned to me with a conspiratorial air, before revealing that if I boiled the leaves I should keep the cooking water in a covered pan outside overnight. The next day I was to sip the chard infusion, and then, he smiled, “run to the nearest toilet, hoping you get there in time. This is the strongest diuretic known to man. Not many people know that”. “How interesting,” I replied, as I wondered what form of suicidal insanity would possess me to willingly prepare and take the strongest diuretic known to man. You will be relieved to hear that the cooked leaves do not have the same effect. Apart from this folk remedy of dubious worth, he didn’t tell me much else, except that he usually boiled chard and then dressed it with lemon juice and oil, which is pretty much the default Sicilian treatment for any green-leafed veg, whether chard, chicory, mustard greens or spinach. Either that or sautéed with garlic and chilli. But I wanted something a bit different. For lack of inspiration, I turned to the net, where I stumbled across a couple of interesting ideas. The one I’m sharing with you struck me as the best, not least because I always have lentils in my store cupboard. Sicilian lentils from the centre of the island also happen to be very good. 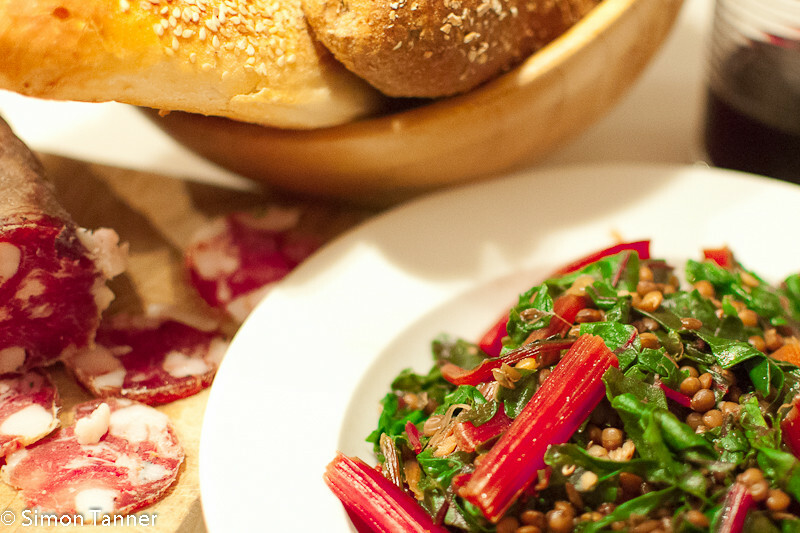 Here, the earthy taste of lentils meets the equally earthy taste of chard. My daughter told me, with her trademark directness, that the dish was “quite nice, if you like the taste of soil”. Appreciate your comments as I may, dear, I would actually suggest that earthy in the chard-mushroom-lentil way is an attractive quality, and not quite the same as getting a mouthful of mud on the rugby pitch. 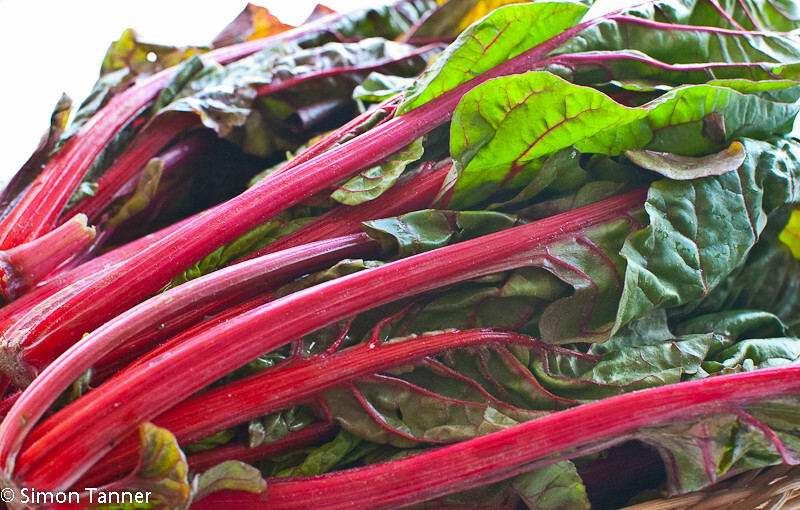 Earthiness aside, chard, like its cousin beetroot, also has a certain sweetness, and this is where the chilli and lemon juice/vinegar come in, to provide contrast and balance. This dish, as presented here, is fine as an accompaniment to cheese or pork (sausages in particular), but is also great on its own. You could also use stock instead of water, in greater quantities, and turn it into a soup. If you decide to do this, I would definitely go for lemon rather than vinegar. You could also, of course, use any of the less colourful varieties of chard. It will taste the same; it just won’t be as pretty. Cut the chard stalks into batons and shred the leaves. Heat half the olive oil in a large pan. Add the chard stalks, garlic, and chilli if using, and stir-fry for a minute. Add 100ml of water. Cook over a low heat for 8 minutes, adding a touch more water if necessary, then add the leaves and stir-fry for a couple of minutes until the leaves are wilted. Add the lentils and heat through for another minute or two. Season, add the rest of the olive oil and the lemon juice or vinegar, stir and serve. This entry was posted in Recipes, Vegetables & side dishes and tagged chard, legumes, lentils, vegetable by hungryenglishman. Bookmark the permalink. Good one! Except I don’t eat veg! The bloke with the Smith and Wesson is a mate of mine!